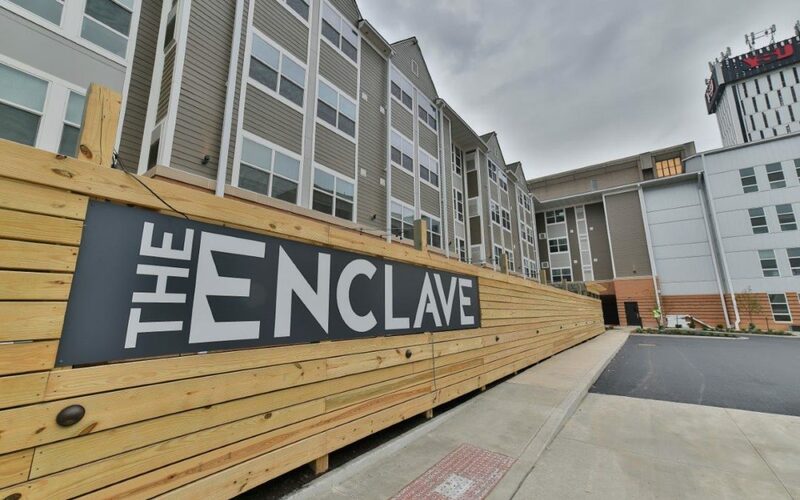 Fiorilli Construction recently completed The Enclave at Youngstown State University, a 106,000 SF ground-up, off-campus student housing facility that provides fully-furnished apartment-style living with a touch of luxury. Developed utilizing a P3 format between LRC Realty and Youngstown State University, the new building includes 65 student units with en-suite washer/dryer and full kitchens, and a total of 194 bedrooms (each with its own bathroom). Building amenities include a fitness room with built in classroom, bike storage, study and multipurpose lounges, and outdoor amenities. Fiorilli was selected as the General Contractor to provide redevelopment of the site through complete turnkey construction. The Owner made the decision to bring Fiorilli in early in the process (50% Design Documents) which allowed Design Assist subcontractors to be engaged for both framing and MEP to enhance value engineering and identify long lead items. The team was able to secure the necessary lumber package early at a significant cost savings and identify where pinch points existed in the critical path of the project to eliminate impacts to the schedule and budget. Located at the edge of a busy, urban college campus, strict attention to safety and logistics was necessary to perform redevelopment of the existing parking lot to prepare the site and build the new four-story structure. The project schedule was developed to take advantage of times where student population would be lighter, with the balance of the work completed in the summer of 2018 in order to allow students to move in for the fall semester. Students were able to move in on schedule and are rating their experience a 5 out of 5 on the facility’s Facebook page. It has been so popular that there is currently a wait list for the 2019-2020 season. The newest trend in student housing seems to have found a spot in the hearts of the Youngstown State University Penguins.